CTLE Blog: How can I use a blog to teach? Many of you may be familiar with blogs - people use these web journals to keep in touch with family and friends, write about their own experiences, or comment on topics and issues they find interesting. But can a blog be a teaching tool? As many of us try to adjust our teaching to the new generation of students (known as the Millennials), we look for ways to make use of the technologies that many of these students are familiar with. Blogs can be a great way to make course content accessible to students (and promote learning outside the classroom)! So what can you do with a blog? Some instructors use blogs to post updates and announcements about the class, or provide reflections on that day's lesson. Have you ever promised to get back to a student on a question, but then didn't have time in a later lecture? A blog is a great forum to provide supplementary material and answer questions that may be slightly tangential to the main thrust of the lesson. Blogs can be interactive, too. Students can post comments and questions, or you can allow them access to create and post their own contributions. Potentially, you could use a blog to give students a forum to present their work. Imagine group presentations given completely online - with written work and embedded video! The comments function would allow classmates to leave peer feedback without the pressure of having to speak in front of the whole class. You may find that your quieter students, or those who need a little more time to think before answering a question in class, come to life online. 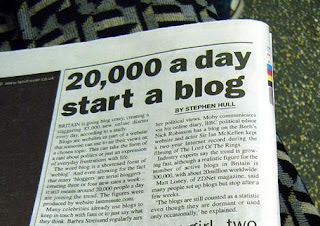 Of course, blogs have their drawbacks too. First of all, you need to learn how to use them. Luckily, there are many free blogs available (simply do a search for "blog", and you'll find a long list), and most have user-friendly interfaces and straightforward user guides. Also, the University of Utah has resources available for instructors eager to incorporate technology into their classroom. Drop by TACC (the Technology Assisted Curriculum Center located in the Marriott Library) and they can help lead you through using your blog. Another consideration is that not all of your students may be familiar with blogs. You may want to take a few minutes from class time to provide a "guided tour" near the beginning of the semester (also a great idea with other online tools you will be using! ), and create a document or page that outlines some frequently asked questions (like our "How to navigate the CTLE blog"). Have you used blogging as a teaching tool? What worked for you and what presented a challenge? Do you have tips to share? Please leave a comment and share your thoughts, ideas, and links to your blogs! CTLE holds a Brown Bag meeting most Fridays from 12:30-1:30 in the Sill Center conference room. This is a time to chat informally with other instructors on campus. Share teaching ideas, ask questions, or try out activities - just don't forget to bring your lunch! Our next meeting is Friday, February 20, 2009. Hope to see you there!